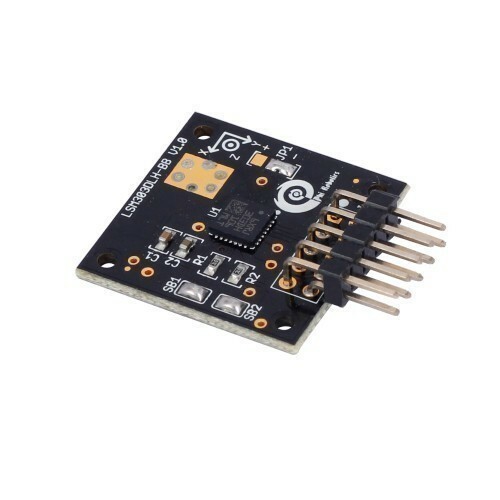 LSM303DLH is a sensor that combines a digital 3-axis accelerometer and 3-axis magnetometer into a single package that is ideal for making tilt-compensated compass. It has a linear acceleration full-scale of ±2 g / ±4 g / ±8 g and a magnetic field full-scale of ±1.3 / ±1.9 / ±2.5 / ±4.0 / ±4.7 / ±5.6 / ±8.1 gauss, both fully selectable by the user. The LSM303DLH includes I2C serial interface that supports standard mode and fast mode.The internal self-test capability allows the user to check the functioning of the whole module in the final application. The system can be configured to generate an interrupt signal by inertial wakeup/free-fall events, as well as by the position of the device itself. Thresholds and timing of interrupt generators are programmable on the fly by the end user. Magnetic and accelerometer parts can be enabled or put in power-down mode separately.